Last night I was taken for a traditional Saudi meal by two local colleagues. 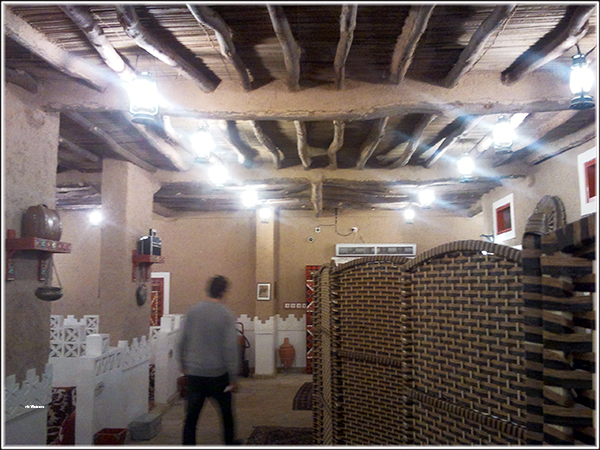 The restaurant decor was very interesting with walls made of a mixture of mud and date palm. The ceiling consisted of rough shaped small tree trunks with thinner branches overlayed diagonally. Then a further layer of mud brick was applied. Saudi’s eat sitting crossed legged on the floor or reclining on their sides. 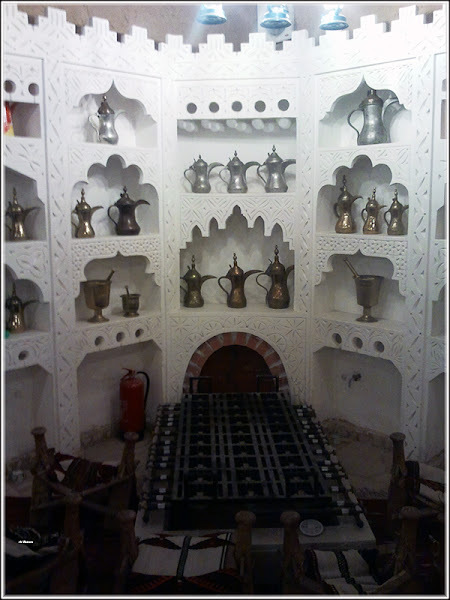 Food is communally eaten from plates placed on the floor. Everyone eats with their right hand. The left being used for personal ablutions. In one corner of the restaurant was a small unlit oven with the gaming board in front surrounded by low timber stools. The stools actually looked if they were saddles for camels. My colleagues wanted me to have the full experience and had booked a private room for the meal. It was large enough to hold 30-40 people, however there were only the three of us. I’m too damned old and stiff to sit cross legged or kneel and had to recline. The meal consisted of three different rice dishes, goat, mutton and camel along with some dips and that traditional Egyptian dish which looks and tastes like purée lawn clippings. Saudi’s are extremely polite and hospitable. Throughout the meal Azoz kept breaking up the meat with his fingers and placing the best pieces in front of me to eat. The eye of the sheep was particularly delicious. OK, I made that part up! We had a long and pleasant meal and to my surprise I didn’t fall asleep during it from the jetlag. After the Saudi restaurant they took me to a Syrian restaurant for dessert. There was no room in my stomach but they insisted I try two of the desserts. I’m now officially BUFF. The Big Ugly Fat Fella.